The Sony 24mm F1.8 ZA Carl Zeiss Sonnar T* Lens is a bright, wide prime lens by Carl Zeiss, suitable for portrait, low-light shooting, landscapes and every day shooting. Designed with Carl Zeiss T* coating on lens elements to reduce internal reflections and flare for high contrast images. Featuring a large maximum aperture of f1.8 and 7-blade circular aperture creates beautiful defocus effects. 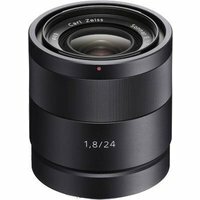 The Sony 24mm f1.8 ZA Carl Zeiss Sonnar T* lens offers a close focus distance of just 16mm for macro shots plus direct manual focus for precise, fine manual control. Smooth, quiet, high speed AF operation the superior optical design delivers corner-to-corner sharpness for extremely high resolution, even at maximum aperture. This lens is designed for Sony's APS-C E-mount cameras.